Come have a spooky good time and lead a hand! The committee is hard at work; trying to plan the best Spooktacular yet! Please think about giving us a little bit of your time this September! 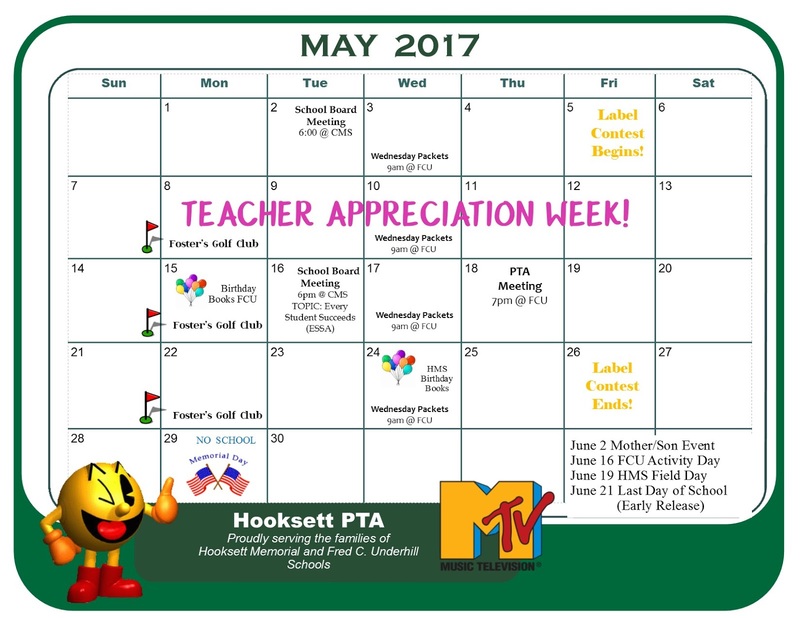 The Hooksett PTA sponsors 4 nights of ice cream and socializing during all the open house. Click here if you could give us a hand! 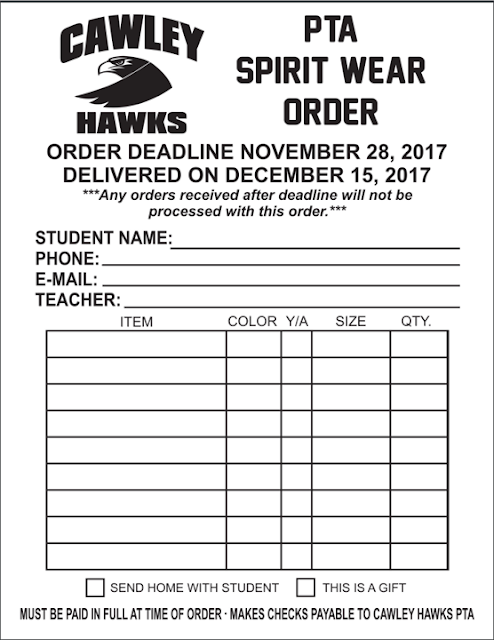 Welcome letter for the 2017-2018 school year! The Hooksett PTA welcomes all of you to the 2017-2018 school year. 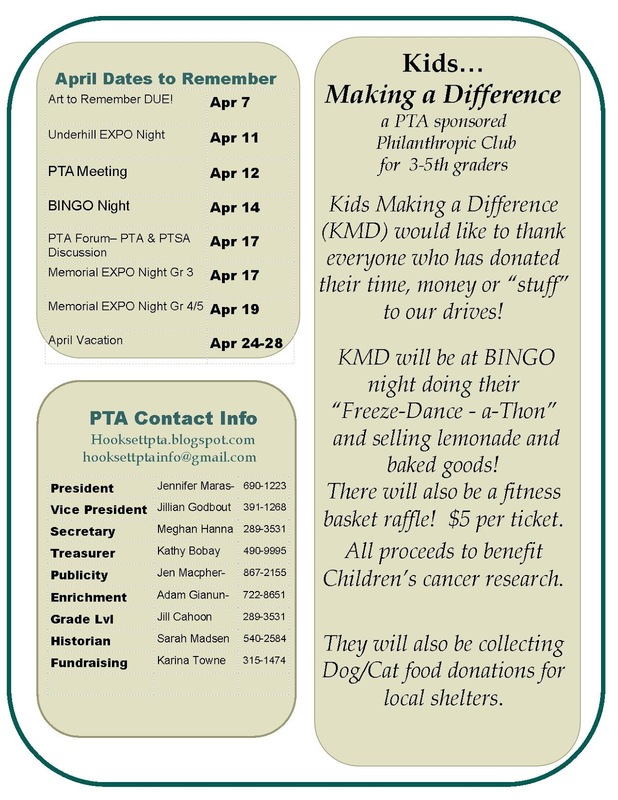 Our PTA is your local chapter to our nation’s largest child advocacy organization (National PTA). The Hooksett PTA strives to be a powerful voice for all children, a relevant resource for families and our community, and a strong advocate for the education and wellbeing of every child. 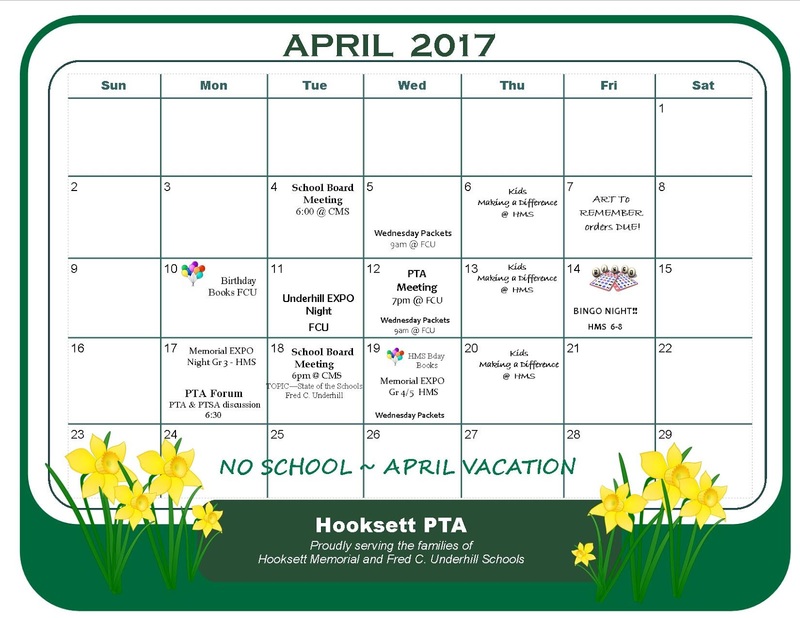 We do this is many ways through the Hooksett’s three schools. 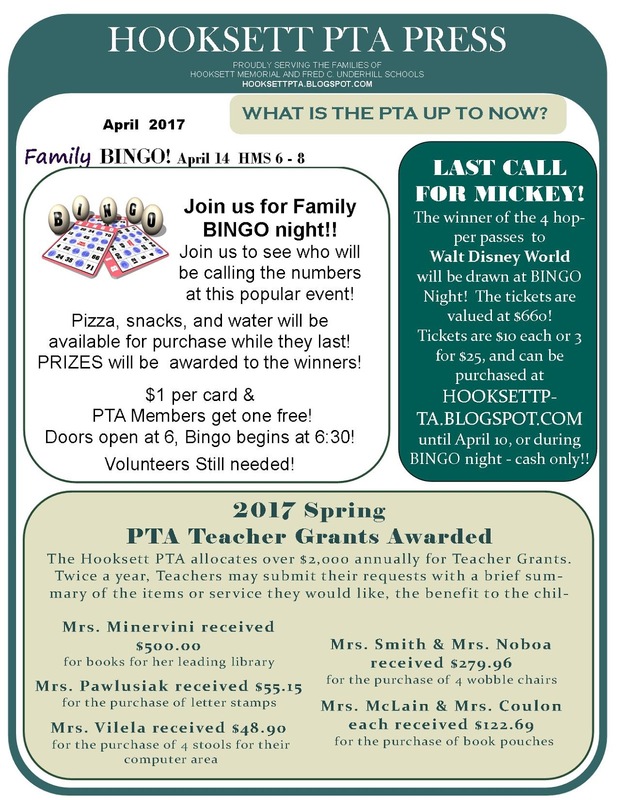 We supply the community with low cost family engagement opportunities such as Spooktular, Get Fit Night, and Bingo Night. 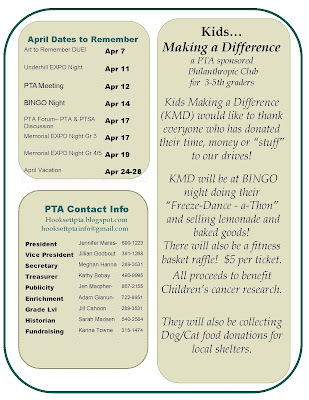 We help our students by sponsoring, school dances, afterschool clubs, activities, and, fun-fill educational assemblies. 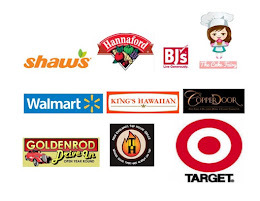 We help staff with teacher grants, enrichment funds, and volunteers. We bring forth parent information nights to help education our parents and community on current pressing topics. 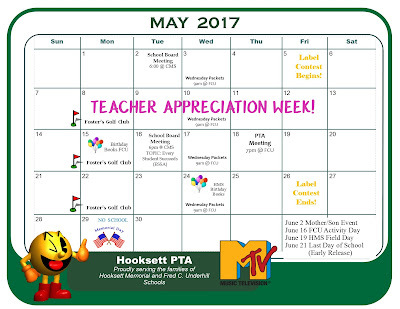 We hope you will continue to supports us by joining us at: hooksettpta.blogspot.com. Hopefully, not just with your membership fee but occasioning helping us out by leading a hand. A few times a year we need help selling dance tickets, volunteering a couple of hours working a community event, baking a sweet treat, or coming to a meeting. 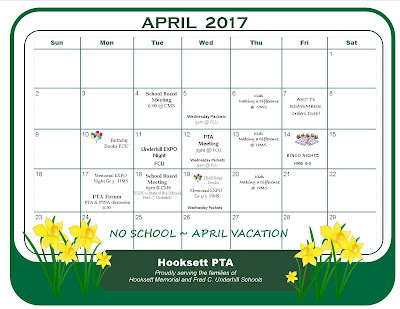 We invite you to check us out at hooksettpta.blogspot.com come join in on the fun of another exciting school year here in Hooksett! 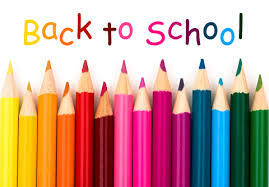 We love hearing from our membership please bring forward input and suggestions as we gear up to make sure every child here in Hooksett has a great school year! Fosters Deadline extended until May 1! 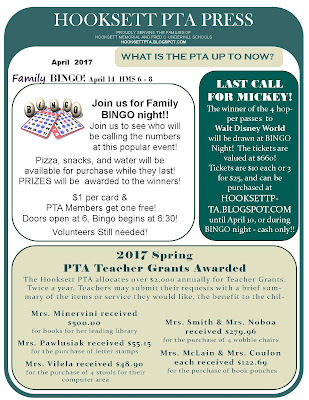 The next PTA Public Forum will be held on April 17. 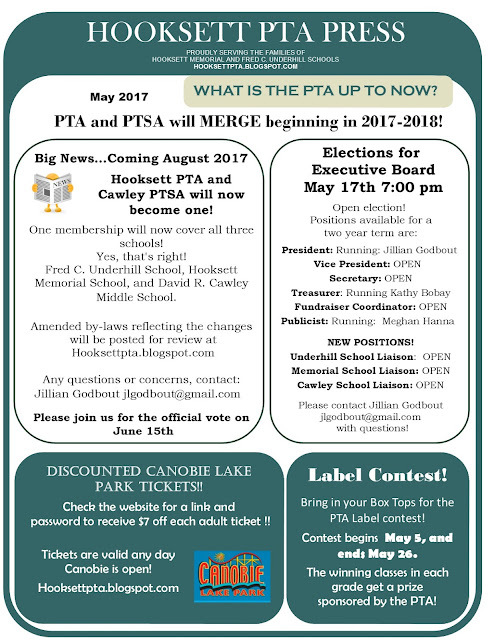 Join us to continue the discussion on the PTA/PTSA merger! 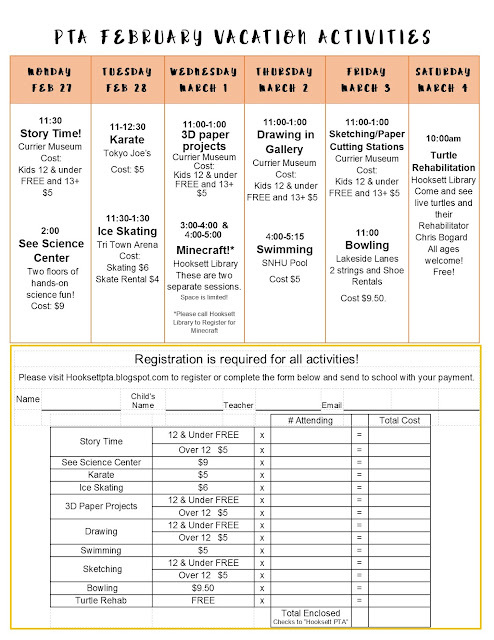 Click HERE to register for Vacation Activities! *Read to Succeed deadline has been extended to Friday February 24 because of our many snow days. Forms will not be accepted beyond this date! 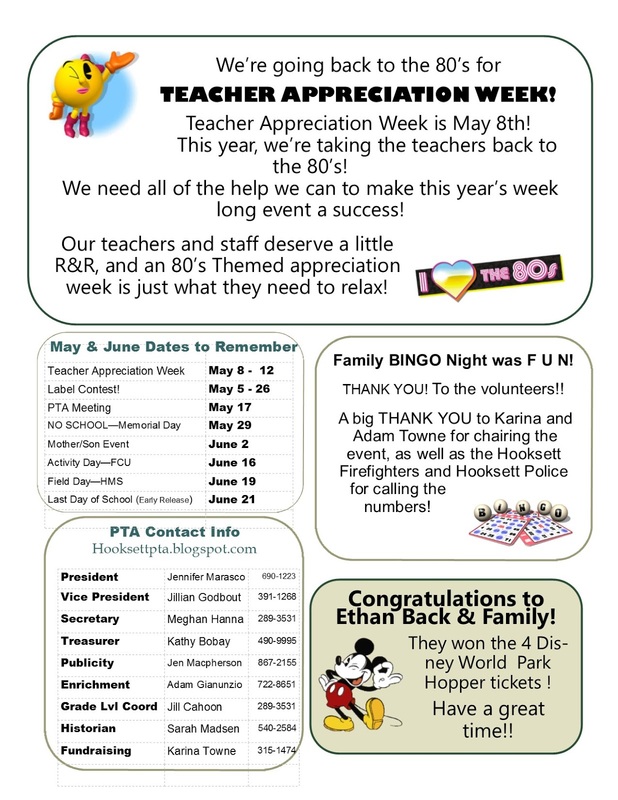 Click HERE to download form to signup to volunteer for Teacher Appreciation Week. Remember, even a little time donated goes a long way!! Click HERE to purchase Disney Raffle Tickets online!